Periodontal disease is not limited to our canine friends. 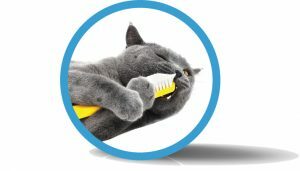 Cats are subject to their own dental issues, such as Tooth Resorptive Lesions: This condition occurs in 60-70% of cats. It is extremely painful – cats under full anesthesia can jump when the problem tooth is probed. Most cats, however, do not show their pain and the early stages can be hard to see since these lesions start on the gum line.